The cover of the Fall 2009 issue of Connecticut Explored (formerly The Hog River Journal) features NFA’s 1898 football squad. Geoff Serra, Director of Communications & Public Affairs writes about the longest-standing high-school football rivalry in the nation. 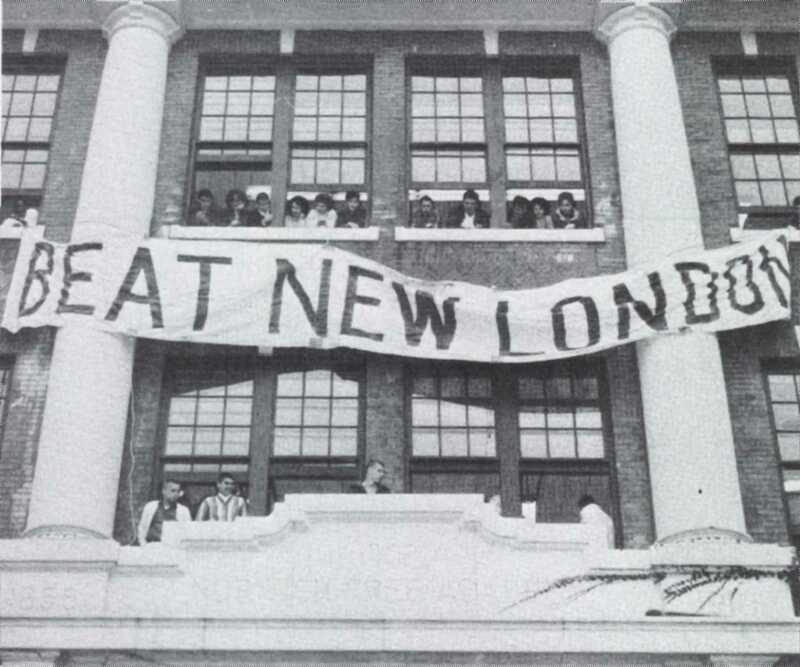 NFA has been playing New London since their first match May 12, 1875-just six years after the first collegiate American football game between Princeton and Rutgers in 1869. 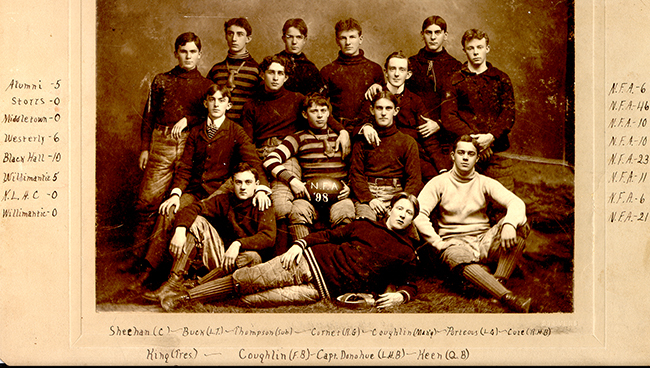 Fourteen members of the Norwich Free Academy (NFA) 1898 football team draw the camera’s eye to the center of the photograph where one player, dressed in a striped rugby-like shirt holds a football labeled NFA ’98. His look is direct, open, perhaps defiant, and certainly smug. His teammates, most dressed in quilted knicker-like pants, heavyweight knitted knee socks, leather shoes, and solid colored turtle neck sweaters, surround him in a kind of relaxed, confident embrace. On the floor in front, a relatively tall lad, reclining on his left side, hair parted jauntily in the middle, stares into the camera. His left hand touches the leather “head harness” next to him on the floor. The whole picture conveys pride, skill, confidence, strength and youthful bravado. It is one of the oldest football photographs in the Norwich Free Academy archives. Taken less than thirty years after the first collegiate American football game between Princeton and Rutgers in 1869, the photograph reveals a somewhat spherical ball giving testament to the transition of the early round rugby like football, through a more watermelon shaped ball, until l935 when the ball took on today’s shape and size. Merrill nose masks, early football gear, hang from the necks of the two in striped jerseys. When worn, the nose masks were held in position by a flexible band worn across the forehead to protect the nasal ridge, nose, and teeth. The Norwich Free Academy, incorporated 1854, and opened in 1856. By 1898 when the photograph was taken, the NFA– New London football rivalry already had 23 years of history. The rivalry originated between the Norwich Free Academy and the Bulkeley School for Boys in New London, and continued until 1951, when Bulkeley merged with New London’s Chapman Tech to become New London High School. The Bulkeley Tigers then became the New London Whalers, and school colors shifted from orange and black to green and gold, but the rivalry with the Academy Wildcats, the red and white, continued. According to Gary Makowicki, today’s NFA Athletics Director, the current tally for the rivalry (as near as can be determined) is Norwich Free Academy 74 wins, New London 61 wins, and 11 ties. The 134-year-old rivalry has become an institution in southeastern Connecticut, and it has seen its share of excitement, unusual occurrences, and both good natured and intense competition. In 1886, NFA officials discovered a member of the Bulkeley faculty was a star player in the lineup, a far from uncommon occurrence in the early days of high school football. Bulkeley secured its first victory with the aid of several young men home from college. In that 1910 game, Bulkeley alumni participated in play in order for the school to field a team. One story has achieved legendary status. In 1889 on a grey, overcast November day, the match took place on the Billard Academy field near Pequot Avenue adjacent to the harbor in New London. In mid game an intense snow squall hit, and when an Academy player sent the ball flying on a high punt, it disappeared into the snow. The game ended there because there was not another ball to replace the lost one. The story was passed from Frederic H. Cranston, class of 1891, and NFA faculty from 1898-1943, to Paul Bradlaw who was a NFA faculty member for 47 years (1918-1965) during which he served for many years as financial advisor to student athletics. Since then, periodically, hints and rumors surface about the whereabouts of that lost ball. All have been false starts or dead ends. As recently as three years ago, the new head of school was provided with a “lead” concerning the location of the missing ball! In 1902, the score already 130-0 in NFA’s favor, Bulkeley gave up a few minutes into the second half. In 1909, the NFA timekeeper allowed play to extend thirteen minutes during which time NFA scored a touchdown to tie the game. He ran for his life when the error was discovered. A memorable game in the early years was the 1911 game. It ended with a New London victory 11-5, but NFA disputed the outcome and protested to top football expert Walter Camp, a New Haven native, Yale graduate, and football player. In time, Camp had a tremendous influence upon shaping the game of football in America and is often referred to as “the father of American football,” and until his death in 1925, Camp edited the American Football rulebook. The play in dispute involved a punt, a fumble, and a recovery at the goal line, claimed by NFA as a touchdown but not ruled by the referee as a score. At the time, touchdowns were worth five points, and the Academy claimed that had the touchdown been called, and had the extra point been secured, NFA would have tied the score. Camp agreed, and ultimately gave NFA the tie. In 1923 Bulkley routed NFA 33 to 0; the rivalry had become so intense that NFA alumnus Charles F. Noyes offered a $5,000 donation if the Wildcats would defeat the Tigers in both football and baseball. The Bulkley Annual of that year taunts “We wish you Luck, Norwich, but don’t count to heavily on that offer,” and the Tigers went on to another 33 to 0 victory over the Wildcats in 1924. The history of the rivalry is filled with stories of wagers and fundraising. According to one report, during World War II (NFA beat Bulkley every year between 1941 and 1944, one of the winning footballs was auctioned and fetched a winning bid of $5,000. In 1921 and then again for a brief period in 1970’s, the games were held twice a year, before becoming an annual Thanksgiving Day event. In a notable recent match on a snowy Thanksgiving Day in 2005, the New London team showed up with the wrong shoes to play on NFA’s slick, wet astro-turf. Snow on the New London sidelines had not been cleared, and for some reason, snow shovels seemed not to be handy. After a discussion about snow removal with NFA officials, the Whalers withdrew to the locker room, stalling until the shovels were located, snow was cleared, and their cleated shoes arrived from New London. In that game New London trounced NFA 34 to 3. Over the years, the rivalry spurned elaborate rituals, many of which continue today. Spirited school rallies preceded the matches, sometimes with evening bonfires, and boisterous displays of school colors. These often gave way to pranks, both funny and ill – advised. In the 30’s and 40’s, policemen were on duty the night before the game because enthusiastic fans would try to splash their colors on the rivals’ campus, a far from easy feat, and one which could result in costly cleanup. Prior to the 1948 game, Bulkeley fans were apprehended displaying their spirit in orange and black paint on the NFA campus. Their punishment was to clean up their display of school spirit while school was in session at NFA to the taunts and jibes of students passing between buildings to class. From the late 40’s on, as automobiles became a way of life, hundreds of cars would return either to New London or Norwich, horns blaring news of victory. For a period during World War I, the rivalry was suspended because of the war, and again in the 1950’s because the rivalry became a bit too intense. Harold Arkava, a 1944 Bulkeley graduate and president of the Bulkeley Alumni Association speaks fondly of the rivalry. He says that the entire atmosphere of the school changed before “the annual blowout,” when “nothing else mattered.” Akrava continues, “Everyone got pumped up, but it was the spirit of the thing that mattered. It was the spirit of good fun; it was a healthy rivalry.” Arkava, an intense sports enthusiast, claims that a lot of the excitement resulted from the knowledge on both sides that the competition was of national significance as it had even been covered in the New York Times. The Norwich/New London rivalry wove its way through families and careers. The match on November 13, 1948, is a case in point; it was close to, if not the 100th face off. That game ended in a scoreless tie. On the Bulkeley team were Bob McPhail and his brother Norm, the Driscoll brothers Alan and Dan, and Jim Giodarno. McPhail, who graduated from Bulkeley in 1949, ultimately taught computer science and coached football for many years at NFA before ending his career as NFA Athletics Director. His son, Marlin, a 1978 NFA graduate, became an outstanding Wildcat quarterback. Daniel and Alan Driscoll later distinguished themselves in long careers as English teachers at NFA. Dan, who played offensive and defensive tackle, graduated with McPhail in 1949, and served as NFA freshmen football coach. His only son Jay, a Whaler defensive end, as a sophomore played in the 100thanniversary Norwich/New London game in 1975. In that game, New London beat NFA 28 to 7. Jay Driscoll just completed his 20th year as a faculty member at the Norwich Free Academy. For several years, in the early 90’s he served as an assistant Wildcat football coach, but gave up the position to serve as defensive line coach at the US Coast Guard Academy in New London. Also playing for the Tigers in 1948 was James Giordano who in the 1970’s served as NFA head football coach; he left his House Principal position at NFA to become New London High School Principal, a position from which he retired after many years. The distance between Norwich and New London is approximately 15 miles; in 1875, it may have seemed much greater; however, the psychic distance for the football rivalry has never been great. In the fall, as the game approached, excitement grew, the distance shrunk, and the facts became obscured. Part of the excitement of the rivalry is that some stories and facts are disputed or viewed differently on both sides. Today, that process continues, and on November 26, 2009, once again, the two teams will square off on NFA turf for the 135th year.